Thread: The latest cooling method. A German from Hamburg was so fed up with the noise his PC was making, during a drinking session with friends, he wagered a bet that he could solve the problem. A year later, his PC is still working perfectly still in 30 litres of salad oil. He leaves the ventilators on to keep the circulation of the oil going. 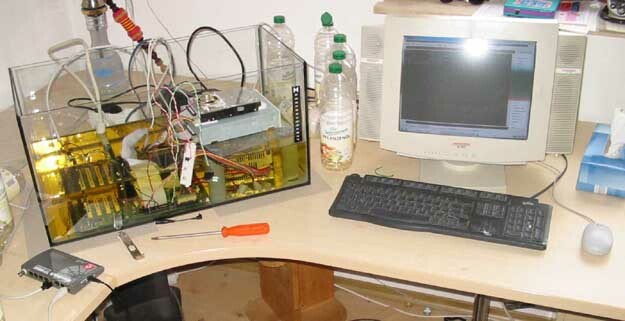 The harddisk is the only thing not in the aquarium which he used as a case for the PC. He does warn that the PC and keyboard and muis need to be on different height levels, otherwise the oil has a tendancy to creep through the cables and leak. The only disadvantage with using the oil as a coolant is that after a while it begins to smell. No English text on the site yet, but says that it is soon to come. Last edited by gringo; 05-12-2005 at 01:42 AM. Lifes a *****, and then you marry one. Well, now that's different, but various oils have been used to cool electrical and electronics before,, remember PCB's in transformers? Also,, the coils in auto ignitions used to be oil cooled, some prolly still are. He could prolly find a more stable oil so he wouldn't get the smell factor. im gonna try something similar.... however it will probably result in shattering the plastic of the motherboard. my dad allowed me access to about 30 gallons of liquid nitrogen... i think ill try something like that and see lol. ill post pics if it works, more if it doest.